What a lovely day to spend in the garden today! With Spring officially here, it’s a great time to sow seeds, both indoors and out. Today, we started the session with all important weeding! There were lots of weeds in our raised bed, so we picked them out using our hands, hoes and hand forks. Some of the roots of the cooch grass were really long! We pulled out as much of these long roots as we could. Once we had got rid of as many weeds as possible, we raked the soil level, ready to plant in soon. Hopefully there won’t be too many weeds springing up in the meantime! While we were weeding, we found some empty snail shells, and then, as we were pulling out weeds from the side of the raised bed, we found a whole city of snails! Next, it was time to chit potatoes. Chitting potatoes just involves leaving seed potatoes in a sunny spot, to encourage them to sprout before they are planted. We chitted a few varieties - Casablanca (first early), Orla (first early), Pink Gypsy (maincrop) and Highland Burgundy, a maincrop potato which is red on the inside! Our work was not done yet! The next task was to sow some seeds. We emptied out compost from bags sold at the farm, and broke it up with our hands into a more fine texture. 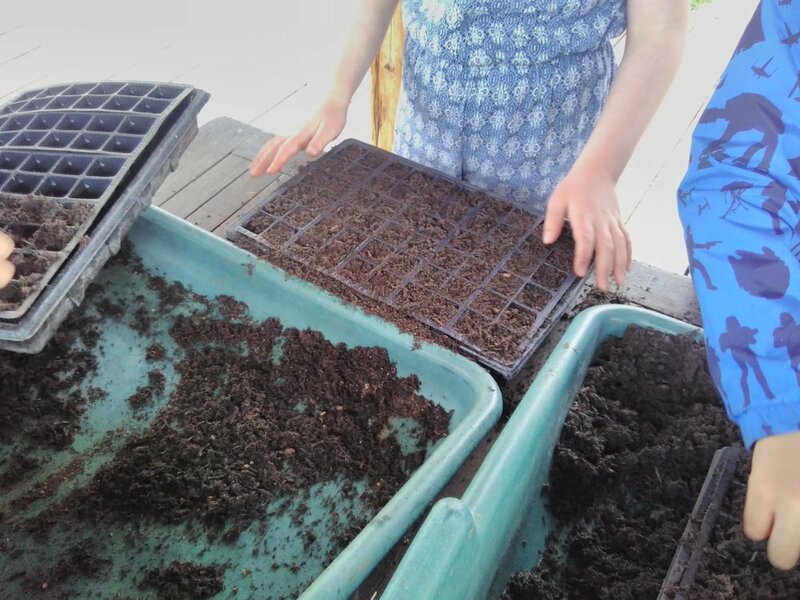 We then filled modules and seed trays with the compost. We then sowed the seeds. Some of the seeds (Cape Goosberry seeds) were sown on the surface of the compost, as they need light to germinate. The other seeds (Curly Kale, Brussel Sprouts, Wildflowers and Tomatillo) needed a fine layer of compost over them to germinate. The next step, of course, was to water in our seeds. We did this with a small watering can, and a larger watering can with a fine rose, so as not to disturb the seeds too much. We sowed a lot of seeds! When we were weeding, we had the idea to make a tea with Cleavers, so once we had finished seed sowing, that’s just what we did! We gathered some Cleavers, as well as Dead Nettle and some Lemon balm and poured hot water over them, letting the herbs steep for a few minutes. Once the water had infused, our volunteers kindly poured out tea for each other. We enjoyed the tea, noticing the different flavours we could identify. One of our volunteers had kindly brought in some treats for us to share, so we drank tea and ate them together!